Last week Italian Easter Pie, now Italian Easter Bread. These Italian Easter breads are fluffy, slightly sweet, rich and soft, like a brioche, flavored with generous amount of lemon zest and a touch of ground aniseed. 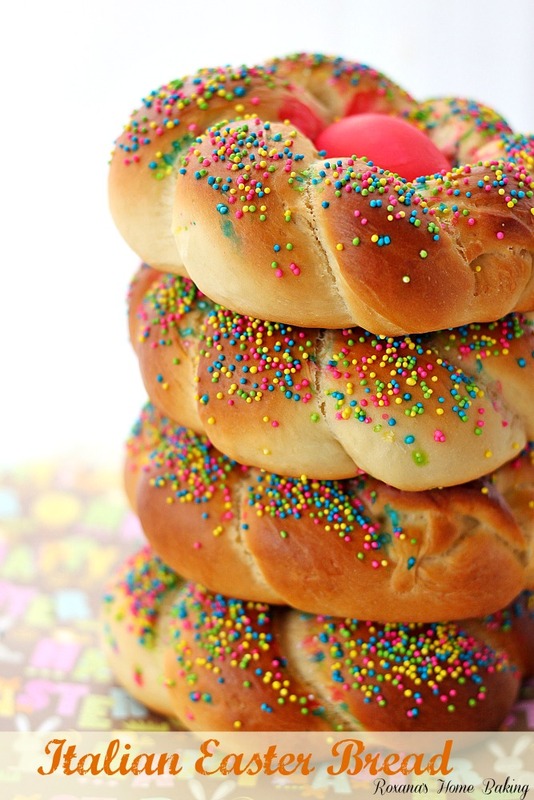 Topped with colorful sprinkles and an egg in the middle, these Italian Easter breads are sure to impress everyone at your Easter table. 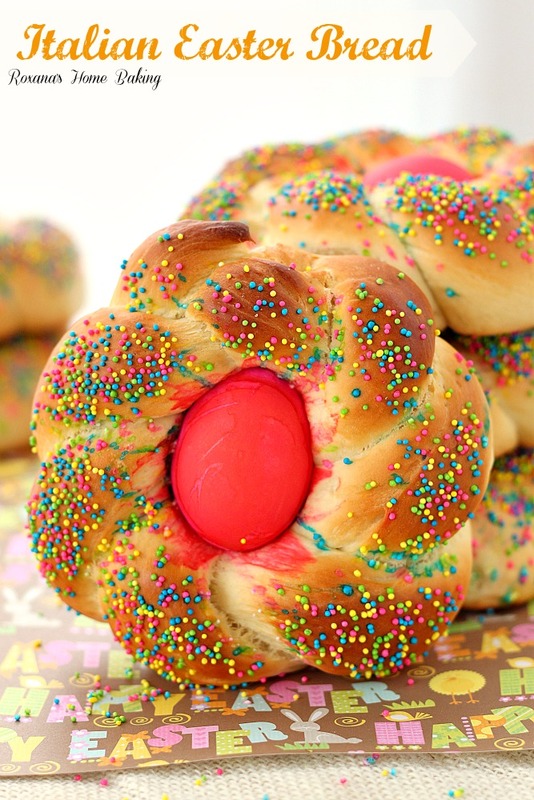 Other Italian Easter Breads I’ve seen shape the bread in one braided ring or one long braid, nesting eggs either in the middle or between the braids. I made 6 small braided rings, each one with a red egg in the middle. I remember seeing this type of bread last year and was very intrigued by the egg nested in the middle. Especially since you don’t have to cook it. It’s going to cook while the bread is baking. How is that for a kitchen experiment? First you start by dying the eggs. I made all of mine red, but you can do different colors if you prefer. While the eggs are resting, putting on the best color coat, start making the dough. There are several recipes for Italian Easter Breads but in the end I decided to use the dough from the Chocolate swirl bread recipe I shared last year, with only two small differences. Added lemon zest instead of orange zest and added a pinch of aniseed. Italian Easter breads - fluffy, slightly sweet, rich and soft, like a brioche, flavored with generous amount of lemon zest and a touch of ground aniseed. 1 bread dough substituting orange zest for lemon zest and adding a pinch of aniseed. In a small bowl add the boiling water, food coloring and vinegar. Stir to combine. 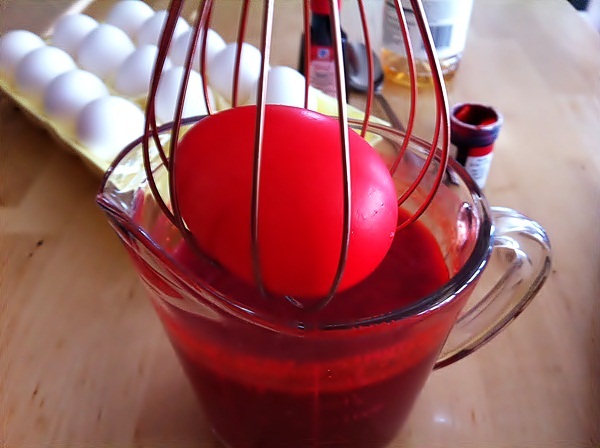 Place an egg inside a whisk and leave it in the water for about 5 minutes. Take the egg out and place it in a paper towel to dry. Do the same with the remaining 5 eggs, adding more food color if needed. Make the dough following the directions and leave it to rise until doubled in volume. When the dough is risen, divide it in 12 small balls. Shape each ball into a 13-15" long rope. Take two ropes and braid them together, forming a ring by pinching the ends. Do the same with the remaining ropes. Place the dough rings on a baking sheet, next a colored egg in the middle of each one, cover with plastic foil and leave to rise for another 30 minutes. Just before baking the rings, brush them with milk and top with sprinkles. Bake for 22 minutes or until golden. Leave to cool completely. Enjoy! 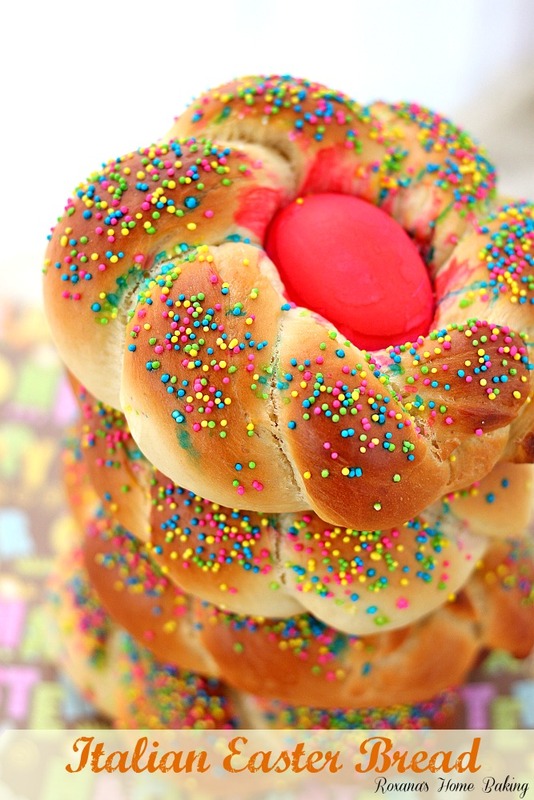 Very possibly the most beautiful Easter bread I've ever seen and definitely the most vibrant and eye-catching! You outdid yourself, Roxana! 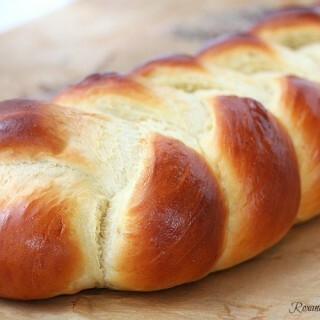 This Easter bread looks like the gorgeous bread my dear Italian grandmother used to make. 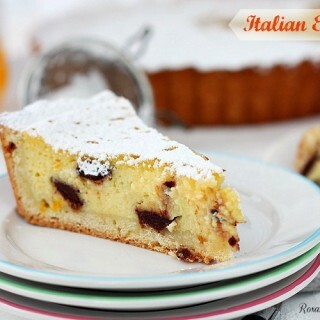 The Italians set the eggs in the bread to signify renewal! 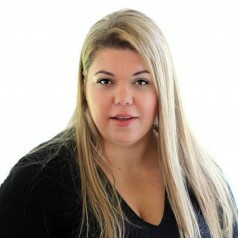 Beautiful, Roxana! Gorgeous, Roxana! I love the sprinkles! Roxana this is really adorable. I think this would make the perfect addition to any Easter table. 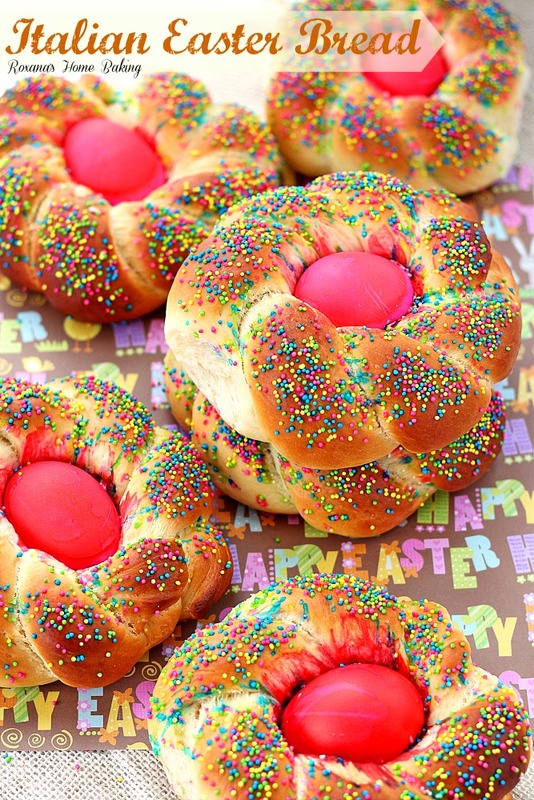 These Easter breads are gorgeous, Roxana! I love how colorful they are...Happy Easter!!! This bread is gorgeous! 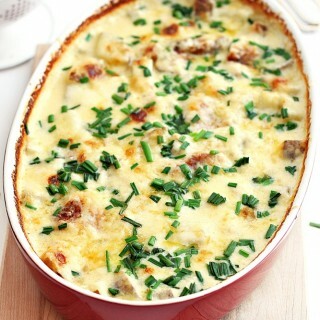 I love that the egg bakes with the bread! SOOOOOO pretty!!! I love it. My MIL makes her easter bread similarly, but not braided and with no egg, for some reason. Perhaps just because it's easier? Regardless, um, I love this. This bread is truly beautiful. It is something I have wanted to make for quite some time. I did make it yesterday, however for some reason the dye on the eggs started to come off during baking. Do you know why that might happen? Other than that the bread turned out really well. They are beautiful and bring back sweet memories from when I was a little girl. May have to practice a few times before next Easter! 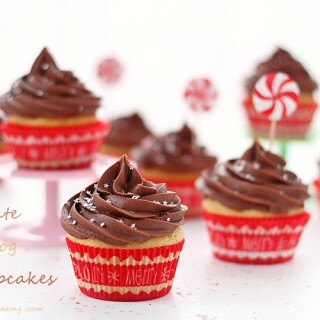 Could these be made the day before eating? If so what us best way to store? Hi Valeri, Yes, you can certainly make these a day ahead. Store them at room temperature in paper bags or in a bread basket and cover with a tea towel. Hi - Your Easter breads look fantastic. I'm going to try them this year (just saw the Pin today). One question - do you think they will keep if made a couple of days in advance? Hi Colleen, You can make the bread a few days ahead, but not more than 3, and store it in paper bags or in a bread basket and cover with a tea towel. 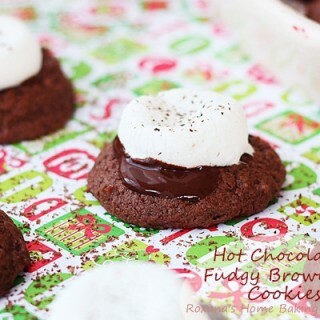 I made these last year and they were such a hit. 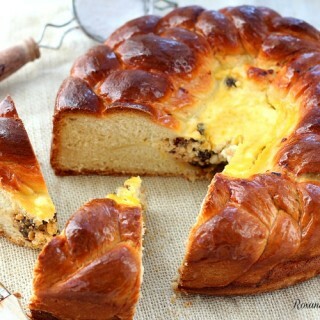 When I was little my grandmother used to make a big 'panelle' of this Easter Bread and we all loved it... great memories. Anyway, I am wondering if you could make the dough in advance and freeze it. Then when you are ready to make the bread take it out. Could you tell me whether you can do this and how? Thank you so much. Hi Alexandra, Of course I did not used the chocolate. That was just for filling the bread. Ad for the brushing, I found when using egg yolk, the bread/rolls turn a little darker in color and in these festive breads I wanted the sprinkles and the color egg to shine, without giving the impression the bread is burned. i made these, also a braided bread with raisins. lovely. 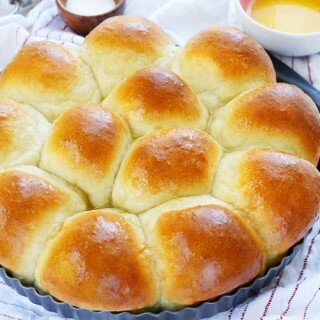 easy to make, and it is still soft on the second day. thanks for the recipe. Hi. I made it last week. I made some small changes, as I use natural yeast. I also quit on the sugar on top and the eggs. I wanted it a bit more simple as I love the lemon flavour. I tried also the other recipe, with orange zest and chocolate. Perfect. Thanks for the recipes, they are great. I'm so happy I have found your website. I usually follow Italian recipes, which are also very good, but I really was in need of some diversity. 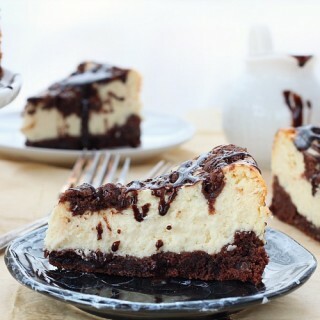 I'm going to continue baking using your recipes.